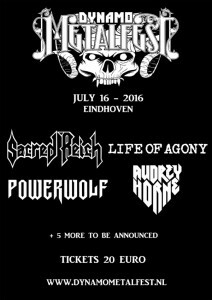 LIFE OF AGONY, POWERWOLF and AUDREY HORNE have been added to the line up for Dynamo MetalFest 2016. 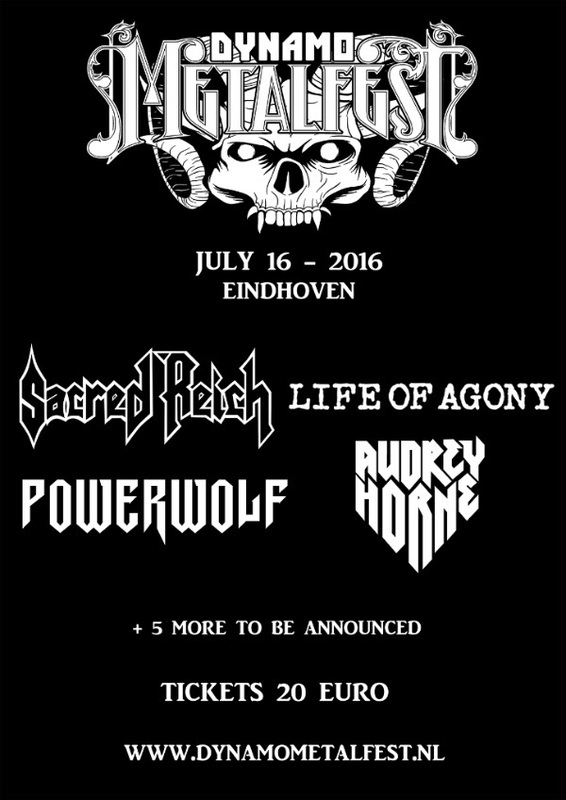 They will be joining SACRED REICH who have already been announced for the second edition of the festival, which will take place at the Ice Rink in Eindhoven on Saturday 16 July. Germany based POWERWOLF are already highly regarded within the power metal genre. Their latest album Blessed & Possessed demonstrates perfectly why that is. Delicious power metal played with a distinctive flair, and good melodies that will have everyone throwing their devil horns in the air. Heads are gonna bang! Can you say hard rock? Norwegians AUDREY HORNE brings their hard rock with gusto! Distinctive vocals, coupled with twin guitar riffs in the best Thin Lizzy tradition – if this doesn’t turn a smile on your face, perhaps nothing will! Sun, beer and AUDREY HORNE – a winning combination. Early bird tickets were put on sale with the announcement of Sacred Reich and are now completely sold out. Co-organiser, Tjerk Maas commented: “The speed at which the first 1000 tickets sold took us by surprise! After twelve and a half hours they were all gone. And we’ve sold another 1000 since already, so we expect this edition of the festival to sell out in advance, just like the first one did. Tickets are available online through Ticketmaster and you can get hardcopy tickets at the Dynamo venue during office hours.